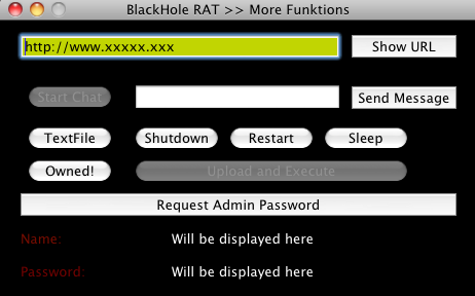 Hello I'm the BlackHole Remote Administration Tool. I'm a trojan horse, so I have infected your Mac Computer. I know, most people think that Macs can't be infected, but look, you ARE infected! I have full controll [sic] over your Computer and I can do everything I want, and you can do nothing to prevent it. So, Im [sic] a very new virus, under Development, so there will be much more functions when I'm finished. But for now, it's okay what I can do. To show you what I can do, I will reboot your Computer after you have clicked the Button right down.